With Hamer Hall playing host to the first two Harry Potter films live-scored by the Melbourne Symphony Orchestra’s this coming November, it seems only fitting that Arts Centre Melbourne’s newest cafe/bar has popped up under a staircase. Okay, the grand concrete sweep of this Yarra River-side spot, tucked into the corner nearest the base of the Princes Bridge, is a tad fancier than the pokey closet poor Harry had to put up with, but there’s definitely a touch of magic as you walk in. 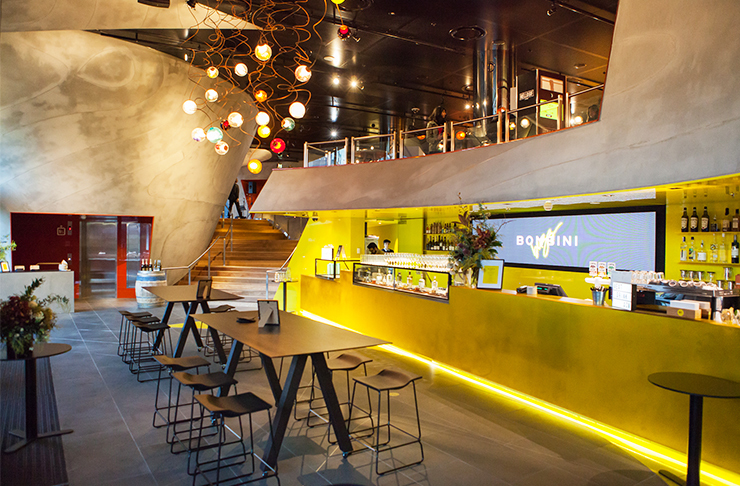 An electric flash of that very Melbourne yellow that adorns everything from the pillars of the old Herald Sun building to The Vault sculpture at ACCA creates a dramatic backdrop to the under-lit bar. That yellow spills over in a flourish on the slate grey-coloured tile floor with matching dark wood Viccarbe tables and Moroso chairs. Catching the passing crowds aimlessly wandering along Southbank’s riverside promenade, Bombini Buzz is a welcome spot in which to soak up the winter sun. As well as the spectacular waterfront views framed by the glimmering city skyline, there’s also a brilliant blown-glass globe chandelier hanging above Bombini Buzz. Designed by Omer Arbel for Bocci, it looks like it teleported its way here from a trippy 60s sci-fi show. You can grab a Seven Seeds coffee in the morning and maybe a sneaky tea time snack of an obscenely finger-licking yum vanilla bean cronut or a gelato from Fitzroy North’s Billy Van Creamy. There are also lunch box combos to go called Buzz Packs, like a coffee with a fruit salad or croissant, or a salmon or chicken aioli bagel with a soda from Moonee Ponds’ Strangelove. With a strong grazing focus on locally sourced produce, cheese-lovers can gorge themselves on fantastic wooden paddle laden with goodies from Port Melbourne outfit Calendar Cheese, like their wonderfully whiffy Tarago River Gippsland Blue or Geelong-sourced Mepunga Gruyere. It comes with a dinky little glass jar of mixed nuts and a wodge of date and apricot loaf. Why not go the whole hog (we did) and match that with the meat paddle from North Melbourne’s Savour & Grace. A super-generous serve of Borgo Whole Australian Prosciutto, Mr Cannubi’s Coppacollo and La Boqueria’s Morcon Ahumado Picante comes with a pile of pickles and crusty bread and more of those cute jars stocked with seeded mustard and sweet relish. This culinary glutton’s combo is the perfect accompaniment to an impressive Victorian wine list that includes Clare Valley drop Dead Man Walking Riesling, the Jack Rabbit Shiraz from the Bellarine Peninsula and Gippsland champion Lightfoot & Sons Rose. Even the whisky hails from around these parts, from Port Melbourne’s STARWARD distillery, just don’t tell your very particular Scottish mates. Classic cocktails that are served in cute cut glass bottles get a Bombini Buzz twist. Their mojito mash-up dubbed the Buzzjito is a sassily refreshing slice of sunshine in a glass, mixing Beenleigh Cooper rum (ok, they cheated, that’s Queensland, natch) with pomegranate syrup poured over chunky ice, fresh lime and mint. Evenings get a little dreamy as the sun goes down over the river, aided by a silkily smooth serve of their take on the Negroni, the Aperoni. Yep, you guessed it, they swap out the Campari for Aperol served over a big wedge of fresh-cut orange with Melbourne Gin Company gin and Maidenni sweet vermouth. There’s also an additional bar space upstairs with a burnt orange backdrop if you can still make it up the sweeping wooden staircase that leads to Hamer Hall’s foyer. 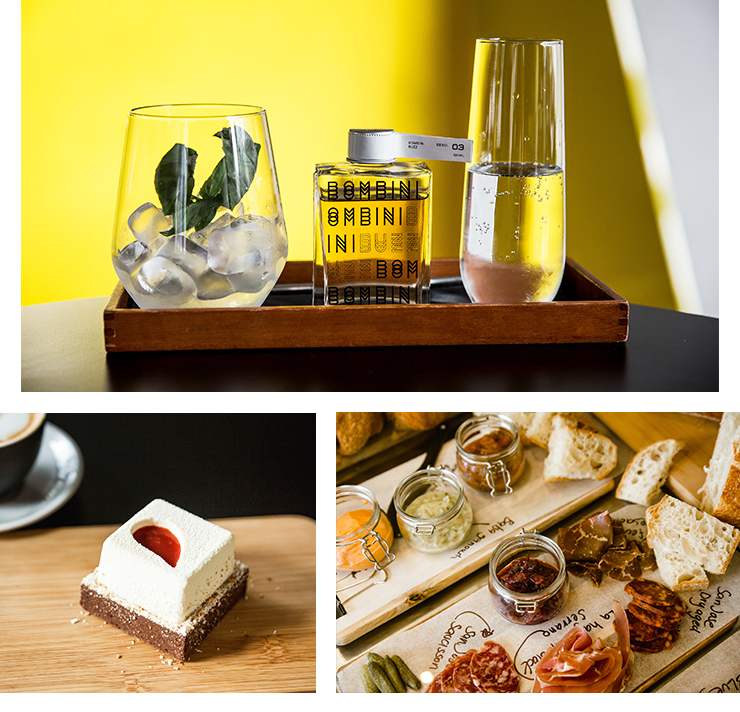 To keep on top of all the latest openings in Melbourne, head here.